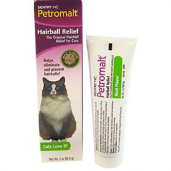 Shop for hairball and constipation remedies for cats at VetDepot.com. It can be awkward and even a bit disturbing to watch your cat vomit up a hairball. As unpleasant as it is to witness and clean up after, this is a normal and healthy occurrence. In fact, it is common for cats to eject hairballs as often as once every week or two, according to Cornell University’s College of Veterinary Medicine. How Do Cats Develop Hairballs? As you have undoubtedly noticed, cats are fond of keeping themselves clean. Hairballs are a naturally occurring result of your cat’s grooming process. When cats lick their coats during their somewhat fastidious grooming procedure, loose hairs sometimes become stuck to their tongues. These hairs are subsequently swallowed. Usually, these ingested hairs pass through the digestive system and out of the body via stool. Sometimes, though, hairs get caught in the cat’s stomach. Over time, swallowed hairs accumulate and turn into a hairball, or a trichobezoar as it is more formally known. 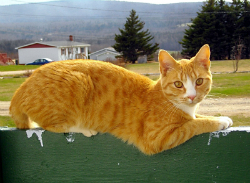 Cats typically vomit up hairballs, but sometimes the hairballs remain lodged in the stomach. This can cause an intestinal blockage. Such impactions are potentially life threatening and require immediate veterinary attention. In rare cases, surgical removal may be necessary. There are telling signs and symptoms that may indicate an impacted hairball. If your cat repeatedly acts as if he or she is trying to eliminate a hairball with hacking, dry retching, gagging, or vomiting, but nothing is coming up, this is strong indication of a problematic hairball. Loss of appetite, constipation or diarrhea, lethargy, and a swollen abdomen are additional symptoms. "Over time, your cat's swallowed hairs accumulate and turn into a hairball, or a trichobezoar as it is more formally known." The best approach concerning hairballs is to take preventive measures. This is especially true if you have a longhair cat, as these types are far more susceptible to hairball formation and related difficulties. Even though your cat is a dedicated self-groomer, you should still perform grooming tasks. Use a cat brush or brush glove designed remove loose hair. The more hair you remove, the less there is for ingestion. Additionally, make sure your cat has ready access to clean, fresh water. Water is extremely important to your cat’s digestive system. Feeding your cat a diet high in fiber will also keep the digestive system functioning well. If your cat frequently develops hairballs, purchase a specially formulated cat food that assists with hairball prevention and elimination. Also, ask your veterinarian about using a laxative product that helps treat hairballs. One such product, Cat Lax, provides laxative effects and lubricates the digestive tract to facilitate the passage of hairballs.